"The concept Borges described in 'The Garden of Forking Paths'—in several layers of the story, but most directly in the combination book and maze of Ts'ui Pên—is that of a novel that can be read in multiple ways, a hypertext novel." "Borges conceives of 'a labyrinth that folds back upon itself in infinite regression', asking the reader to 'become aware of all the possible choices we might make'." 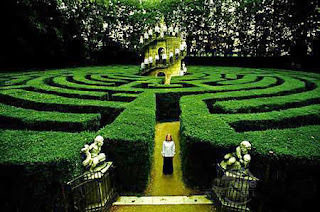 I wonder, now, how can a book be like a maze and can a poem be like a maze too? Borges is lauded as the father of magical realism, so my challenge is that we all allow ourselves to become lost in the maze of language, magic, and endless possibilities. Joining the fray today, Kerry. I have nothing to post as of yet but wanted to just comment on the story. I read the link you sent over my lunch break and found it at first a tad slow but as I went through it the twist was amazing. I won't spoil it here but I wonder if I owuld myself be able to do such a thing. All in the name of a patriotism? The conversation was so cordial and the end so unexpected. It kind of reminds me of todays reality tv honestly. What would you do to get a million fans on twitter? I am rambling but it does make sense in my head. I came back. I posted but I think I missed the mark. After reading the article and Kim's Poem I was stuck on the concept of duality. While on stuck on that idea I was eating a hard boiled egg. I thought to myself "Self what is a more mutiple use and meanings type of thing than an egg?" So I wrote and posted this odd little piece. Decided to add to the mix today. Your comment has piqued my interest in Borges. It's one of those names which has been floating around in the back of my mind for years without anything much attached to it. Thanks. I'm joining in, too (from my other poetry blog). Intriguing and interesting challenge. Labyrinths by their very nature bring out a burst of panic. My brain has been a dusty wasteland in which not a single poem has grown in more than a week. Something about Borges' phenomenal concept sparked a radical idea, which I grabbed on to as tightly as I could. Can a poem be like a maze? "Can a poem be like a maze?" Absolutely, as in one can become lost in a poem. just coming by to say i've been looking at this, reading and thinking. i'm distracted by the coming hurricane, maybe that's a maze in itself, yikes. but even if i end up not writing anything in connection with this, thanks, kerry, for posting it and making me think. Excellent prompt leading off of Borges's birthday. I had never read the story, so that was very interesting. For some reason, I thought of Schrödinger's cat (who also had an indeterminate future) - and the poem I linked to was the result. I finally managed to draw something from my cobweb covered mind for this. It was a really interesting concept and story.